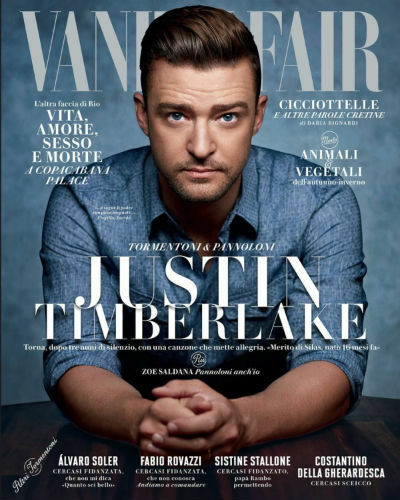 -I don’t get what’s happening with Justin Timberlake‘s face on the Vanity Fair Italia cover. Is it squished or something? Of course, he ended up rehashing the Britney Spears drama in the interview. He just can’t help himself, can he? -In better cover images, I’m loving Kristen Stewart’s look on T.
-Us Weekly says Miley Cyrus and Liam Hemsworth have canceled their Bora Bora honeymoon. Wait, did we even know they set a date?! –Jared Leto acted like a crazy person on the set of Suicide Squad, reportedly whined about feeling “tricked” into being part of that film, criticized the movie without actually having seen it, and yet has STILL managed to land a role in Blade Runner 2. On the plus side, Harrison Ford will squash him like a bug if he tries any of his method BS. -I’m sure the words that accompany this Mike Colter interview are great. I just can’t seem to tear my eyes away from the photos long enough to read them. -Shocking report: Amy Schumer‘s new book is under assault from a brigade of trolls. -Meanwhile, Schumer freaked everyone out earlier today by tweeting “we aren’t making the show anymore” before clarifying that’s it’s not canceled, she’s just too busy touring right now to figure out when the next season will start filming. -Also, here’s a great read about how disappointing the Schumer/Kurt Metzger situation has been and what it says about feminism and compromise. –Stephen Colbert and Samantha Bee both sent Larry Wilmore lots of booze to ease the pain of cancellation. –Kanye West will open up 21 Pablo pop up shops this weekend, including one in Toronto. Please don’t let me by a $700 tshirt. -The latest You’re the Worst promo features Samira Wiley as Gretchen‘s therapist. HERE. FOR. IT. -I probably shouldn’t waste one of my TIFF tickets on the Black Mirror premiere no matter how cool the first images from the show look, right? –David O. Russell reportedly wants $1 million per episode to act like a jerk on the set of his new TV series. -Frankly, I’m surprised it took this long for the dubious pregnancy rumours to surround Amal Clooney. -The US Justice Department says it will end its use of private prisons. Orange Is The New Black, FTW! Who says TV can’t change the world? -Comedy Bang Bang is ending its TV show. Frankly, it was so wonderfully weird I’m surprised it made it five whole seasons. -I’m not sure how I feel about Jason Katims‘ insistence on a Parenthood revival. Great show but that finale was perfect; why mess with it? -The screenwriter of 2016’s Ben-Hur says the movie doesn’t have gay subtext because he was only allow to adapt the book, not the 1959 movie. Can the original movie trademark subtext, though? -You know Joanne the Scammer has hit bigtime when Chelsea Peretti is making cameos. –Tom Arnold penned a passionate essay arguing for gun control after losing his nephew to suicide. -Speaking of good reads, Buzzfeed has a look at the Nate Parker situations and how it exposes the limits of damage control. -I kind of love that even U.S. publications are writing about The Hip’s final show. -Celebrities are having a field day on Twitter about the Ryan Lochte story. –Renée Zellweger and Greg Kinnear befriend a homeless man in the Same Kind of Different as Me trailer. This thing looks so sweet I think I just got a cavity.